On Saturday I joined Chris and Jon at the Precipice climbing area. My shoulder was still hurting, but I figured I could try climbing an easy route with one arm. I couldn’t pass up the opportunity to get on the rock here at least once. 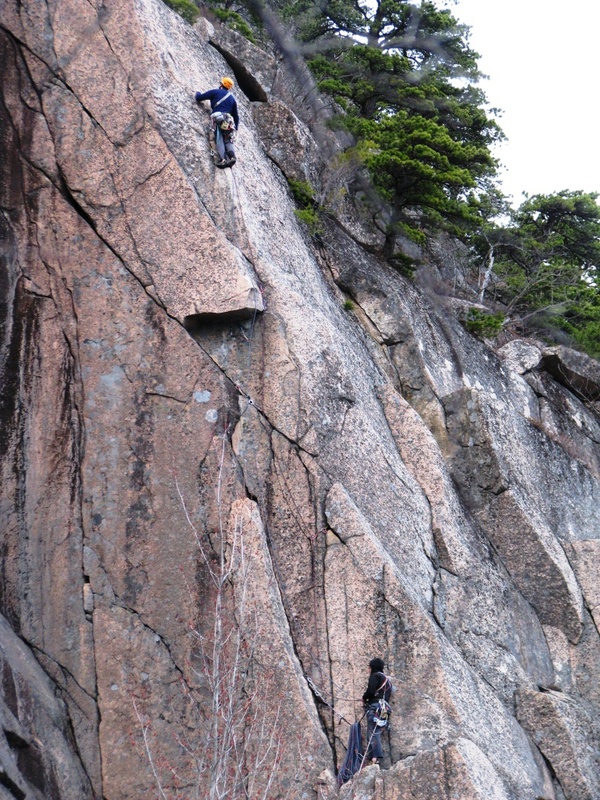 This was my third climbing trip in Acadia. I love climbing here – the rock is clean and sticky, there’s a good variety of routes, there are no large crowds or lineups, and the view from the top pitches is gorgeous. We decided to climb an easy classic – “Story of O”. It’s a sweet two pitch climb with some fun jamming and stemming. I managed to get up the climb without using my right arm too much. It made for some interesting body positioning which I thought was a lot of fun. Once we rappelled down, we were joined by our friends Fred and Cara and their kids Marie-France and Maxime. 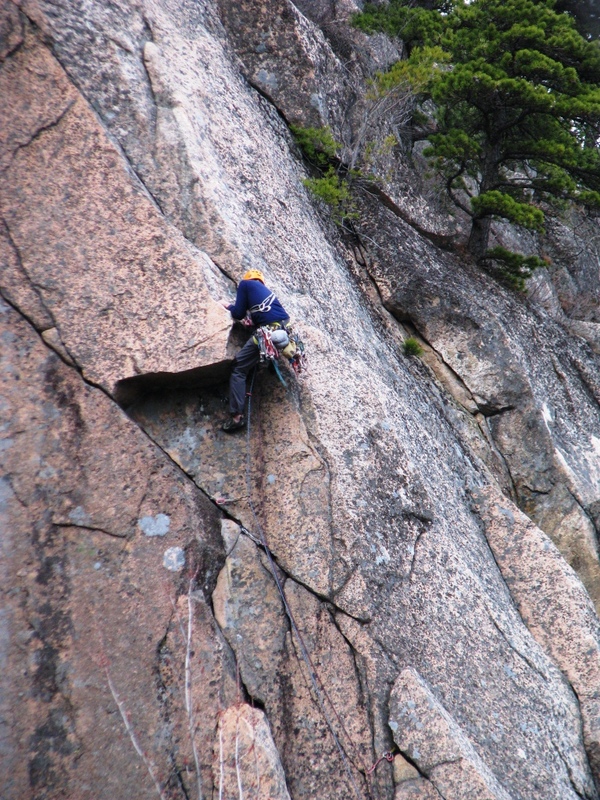 After his parents finished the classic climb “Old Town,” they set up a top rope nearby . 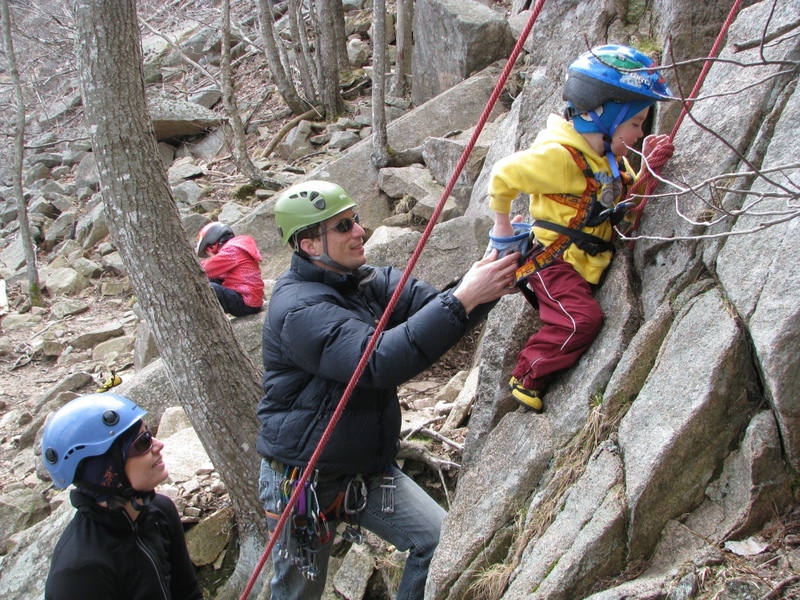 Maxime, 3, harnessed up and put on his cute tiny Sportiva climbing shoes. With a little bit of help from his dad, he was able to get a good way up the cliff . You can see him in the picture below chalking up for his next big move. With huge smiles his parents watched him go. For a pair of climbing parents, this is a big step. Chris and Jon climbed a handful more routes that day including Chris’s lead of “Connecticut Crack” – a tricky 5.11 with delicate footwork and thin cracks. They finished the day with a very cold ascent of “Green Mountain Breakdown.” With the wind starting to pick up I was very happy that Jon was there to climb this with Chris instead of me. I tend to get a bit spooked out on exposed climbs when it’s super windy. 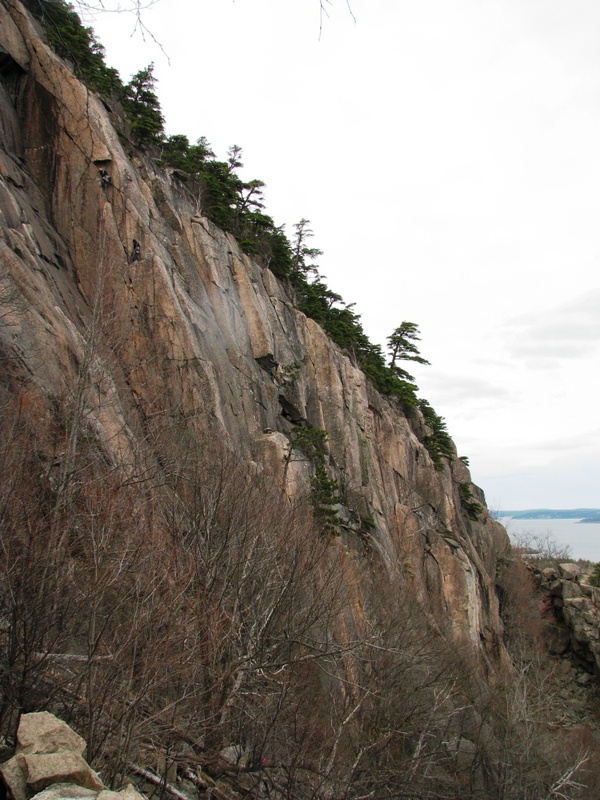 Earlier in the afternoon, Jon Tierney, the owner of Acadia Mountain Guides was out taking pictures of the cliffs for a new guidebook for the area. He mentioned that there will be a climbers’ festival the weekend of May 26 and 27 with movies, talks, demos, crag clean up, and all-around fun. 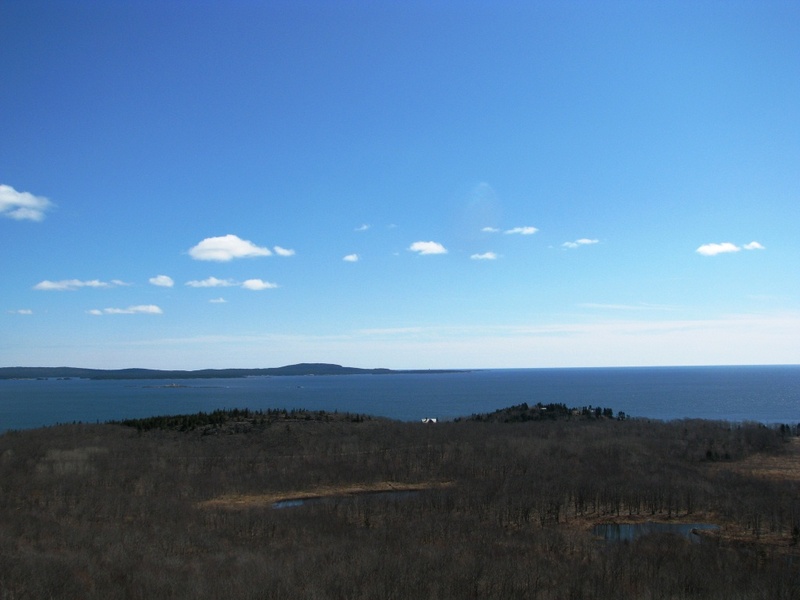 If you haven’t climbed in Acadia before, it would be a good time to go check it out. What a great weekend in Acadia National Park! 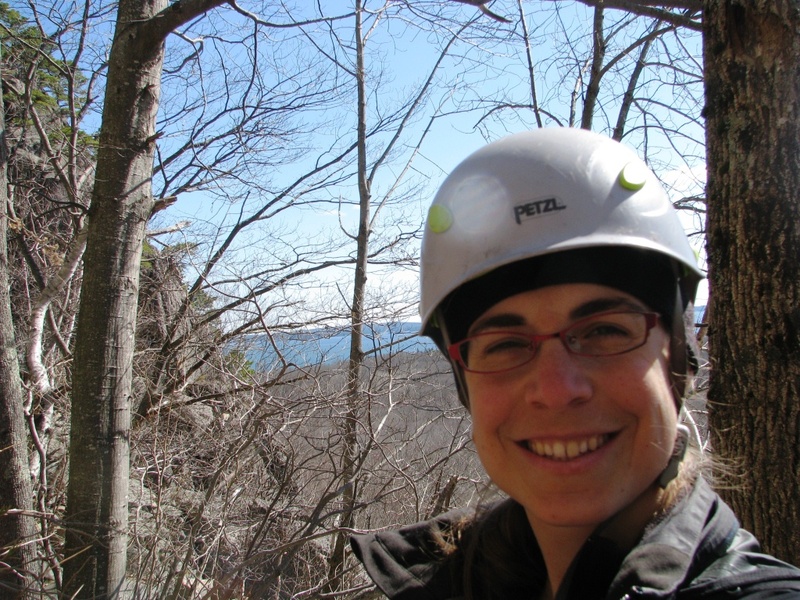 This entry was posted in Climbing, Spring and tagged Acadia Mountain Guides, Acadia National Park, climbing with kids, Connecticut Crack, Green Mountain Breakdown, Precipice, rock climbing, Story of O by marcelledanielle. Bookmark the permalink. Really dig the pics of Green Mt. Breakdown. Never been on it. Looks cool. You’ll have to give it a go next time you’re in Acadia. It looks super scary to me, but I’m sure you’ll be fine. My oldest daughter loves rock climbing! We recently attended an introductory course at Barton Creek Greenbelt with her Girl Scout Troop. We had a great time! Thank you for your post, your pictures are wonderful! Thank you! I am working on one now about our Spring Break trip to Inks Lake and have another day trip we took closer to home. Thank you so much for asking! Looks like a lot of fun. I’ve always wanted to give rock climbing a try but was never with any knowledgeable people to do it safely. Here I see a 3 year old climbing and you doing a climb only using one arm. Way to go. You guys stay safe. It is so much fun! My favorite thing to do outside. You should definitely give it a try sometime, but like you say, go with people who know what they’re doing. It’s a safe sport when done properly, but if not done properly can be very dangerous. 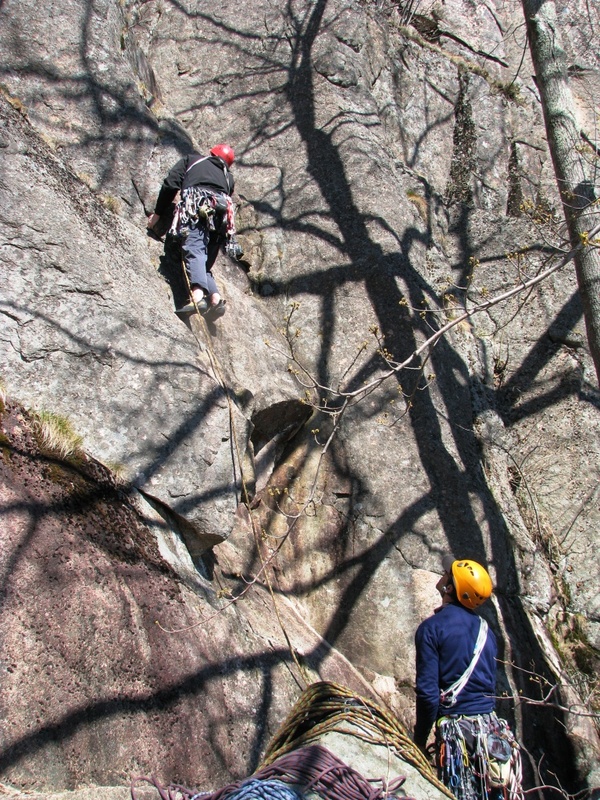 Our rock club here offers introductory rock climbing schools once a year, maybe there is something like that near you. wow, that stone face looks very imposing and you climbed with just one good arm!! That part of the cliff is definitely scary looking! Thankfully the part I climbed was a little less exposed. I LOVE Acadia! Looks like you had a great time! What a great spot for climbing! Have you ever checked out the precipice trail? It looks awesome! So neat to see the little ones climbing. I bet Fred & Cara were thrilled! I know it’s so great to be a climbing family! I know I love taking the girls climbing! !